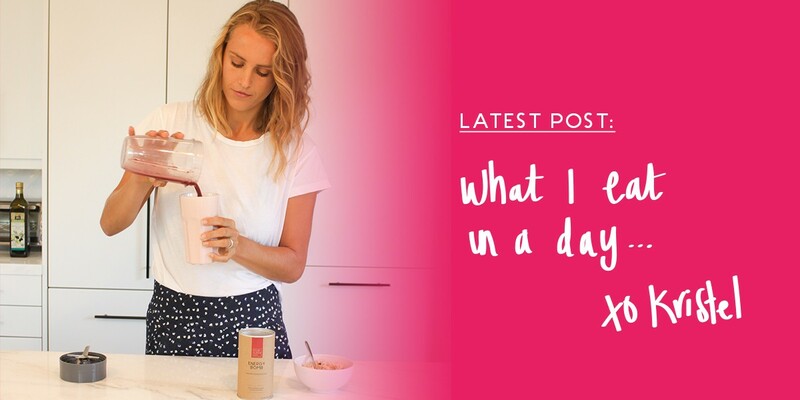 Since a lot of you were curious what my day to day diet looks like and how I use the mixes every day I thought it was the perfect opportunity to share what a typical day of eating looks like for me! And judging from your feedback on Michael's food diary you really like to see what other people eat in a day. I’m so with you on this one! I always get so much inspiration from other people's meals and just think it's so interesting to have a peak in their diet - so I hope this is helpful for you, too! I love starting my day with a big Super Green & Skinny Protein Smoothie (especially during the warmer months) or simply some oatmeal with banana, raisins and any of our mixes - but most of the times I go for the Forever Beautiful and Muscle Power. SO good! I’m not very complicated when it comes to snacks. Usually, it’s just fresh fruit, nuts or crackers with avocado & sprinkle Power Matcha on top! Sometimes I like to make bliss balls for energy - these are my current fave! Or make a matcha latte by simply stirring the Power Matcha mix in almond milk. For lunch always make myself a biiig salad with whatever I have at home. I love the combination of romaine lettuce, brown rice, zucchini, tomatoes and lentils with an avocado dressing. I always add a sprinkle of Super Green on top to get in those extra nutrients! For dinner, I like to make myself some oven roasted veggies like sweet potato, brussel sprouts and zucchini with quinoa, hummus (like adding Super Green or Skinny Protein to that! ), and a side salad. And might have some chocolate lover mousse for dessert! Still not sure how to use them? You can find tons of delicious and healthy recipes on our blog and you can read here how I use all 7 mixes in 1 day.